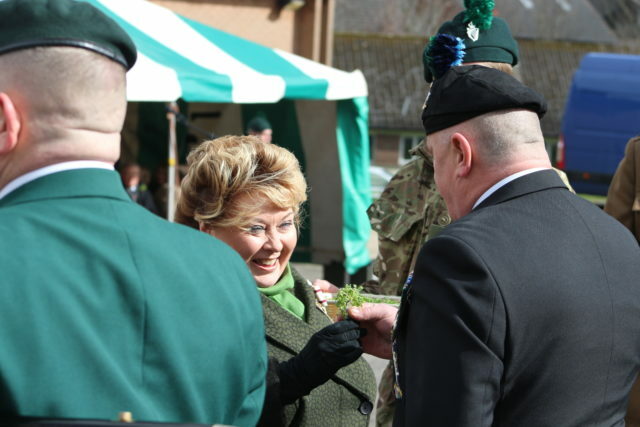 On Sunday a large crowd assembled to watch the proceedings as Lord Lieutenant of Belfast Mrs Fionnuala Jay-O’Boyle CBE inspected soldiers and presented shamrocks during a parade in Belfast to mark the patron saint’s day. On Saturday Lord Lieutenant of Antrim, Mrs Joan Christie OBE inspected soldiers and conducted the annual presentation of shamrock in Newtownabbey, while the mayor of Lisburn and Castlereagh City Council, Councillor Uel Mackin carried out the duties at Lisburn’s Thiepval Barracks. In Enniskillen Deputy Lord Lieutenant of Fermanagh, Major (Retd) Charles Plunkett MBE inspected the troops. Commanding Officer Lieutenant Colonel Paul Walkley said: “St Patrick’s Day is a fantastic opportunity for us to come together to celebrate our regimental heritage and Irishness. “It’s a special day where we get to thank our families, local communities and our veteran community for their enduring support throughout the year. The band of the Royal Irish Regiment and the bugles, pipes and drums of the 2nd Battalion provided music over the weekend. 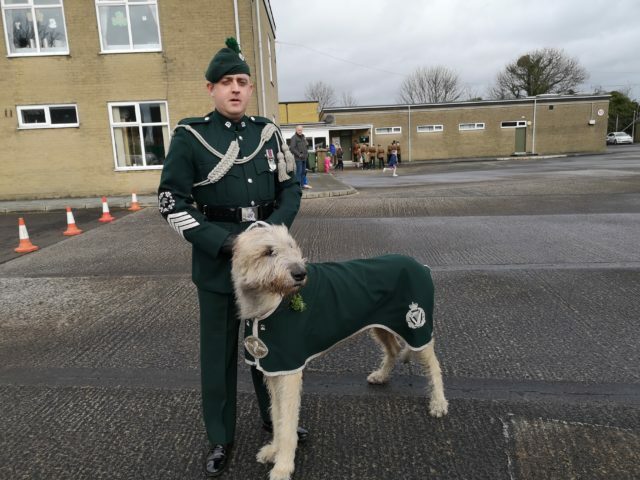 Also present at the events was the Royal Irish Regiment’s mascot, Irish wolfhound Brian Boru X who wore an official green parade uniform. He was accompanied by his handler, Wolfhound Major Moore.